Coral reefs are in trouble. Between pollution, rising sea temperatures and ocean acidification, coral systems throughout the world’s oceans are severely declining – and some have disappeared. However, collaborative efforts by Okinawan fishermen, coral scientists at the Okinawa Institute of Science and Technology Graduate University (OIST) and the Atmosphere and Ocean Research Institute (AORI) at The University of Tokyo have boosted hopes of restoring coral systems. Coral reefs are the most biologically diverse habitat in the oceans, supporting a huge range of life from tiny shrimp to bus-sized whale sharks. In healthy reef systems, this diversity creates an equally healthy living for the communities that fish on them. The inverse is also true: as reef systems collapse, so do economies that are based around them. In Okinawa prefecture, a dire warning came from Japan’s largest coral reef, Sekisei Lagoon, where a survey by the Ministry of Environment found that 50% of the coral had died due to bleaching by the end of December 2016. That aligns with global surveys, which show that 19% of the world’s coral coverage has been lost between 1998 and 2008. A coral nursery in Maeganeku, Okinawa. Corals are maintained on metal posts. In Okinawa, coastal fishermen have acted upon this existential threat, banding together to become coral farmers. Much like planting trees to restore a damaged forest, coral reefs can be “repaired” by settling captive-reared corals in damaged reefs. Working within a group called the Onna Village Fisheries Cooperative, in 1998 the fishers started growing their own mini “forests” of coral colonies mounted on metal supports. A recent paper published in Restoration Ecology outlines a collaboration between these fishermen and scientists from OIST and AORI. Co-authored by Yuna Zayasu of OIST’s Marine Genomics Unit, led by Prof Noriyuki Satoh, the study analyzes farmed coral systems cultivated by the fishermen with the aim to repopulate reefs. Coral can reproduce in two ways: sexually reproducing corals are grown from eggs and sperm, while asexually reproduction occurs when coral pieces are broken off as starter for a new colony, in a process called fragmentation. Fragmentation can happen naturally as a result of wave action, storms or animal activities, producing genetic clones. The first method requires a huge time because– corals spawn just once a year and take many more years to reach a mature stage enough to be able to spawn. By contrast, asexual fragmentation is much quicker and is the preferred method used by coral farmers, but potentially carries long-term risks. As such, scientists have worried that transplanting these corals back into the wild could end up doing more harm than good. The Onna Village Fisheries Cooperative shared this concern, so the group strictly restricted the number of cloned corals in their test site. However, after 20 years after the fishermen started cultivating farmed corals, it was time for the scientists to sample from their coral farms d to determine just how different the genetic diversity of farmed versus wild coral really is, and how many coral clones existed on the farm. 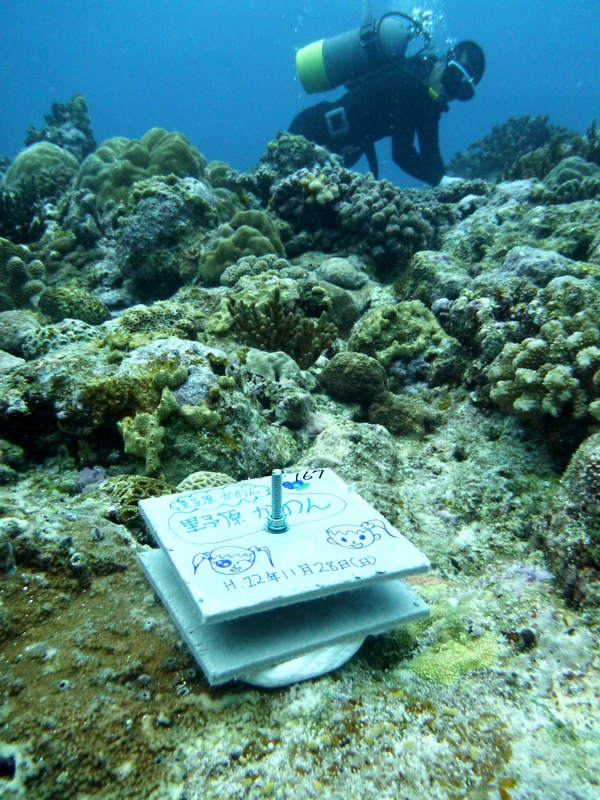 Zayasu and her team collected samples of the coral Acropora tenuis, a common coral species in Okinawa. Cultivated samples came from two coral farms run since 1998 by the Onna Village Fisheries Cooperative, and natural samples came from 15 wild sites around the Ryukyu archipelagos for camparison. To compare the genetic diversity of corals, the team focused on short, repeating DNA sequences called microsatellites. Microsatellites have high variation, making them highly individual and useful as a unique identifier: comparing the same microsatellite location between two coral systems would be like comparing fingerprints between humans. After selecting 13 microsatellites to compare, the team extracted DNA from 132 farmed coral and 298 wild coral samples. The scientists found out that the wild coral system from which the samples were taken did not include any cloned corals, meaning that fragmentation did not contribute to an asexual coral population. They also found the genetic diversity of the farmed coral was as high as that of the wild coral. As such, using the farmed corals to help restore reefs presents little genetic risk to the currently established corals. Likewise, sexual spawning between the farmed and wild corals should not endanger future coral offspring. The team’s results have implications for natural coral restoration. The scientists tagged cloned corals used for this study, enabling the fishermen-turned-coral-farmers to use the tags to track sexually reproduced corals on their nurseries. The percentage of naturally occurring cloned corals differ from one species to another. If these methods could translate to other coral species, farming clonal coral could be a viable way to repopulate reefs. “It’s a great example of a partnership between stakeholders on the reef,” said Dr. Zayasu, of the collaboration that brought together fishermen, academics and local government and communities. The coral farm at Onna, with growing Acropora coral.